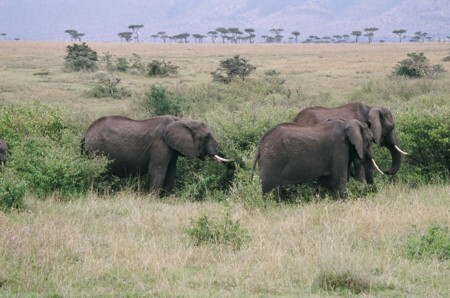 Overpopulation and farmers getting deeper and deeper into forests and other animal habitats are usually the result of old migration routes being cut off, forcing elephants and other animals into unnatural reserves - like the Masai Mara. Their massive appetites can appear to be destructive in those places (Adults may consume up to 170 kg of plant material and dedicate up to 18 hours to this activity daily). But there is something to be said about their role in the regeneration of the forest by spreading the seeds of many species. 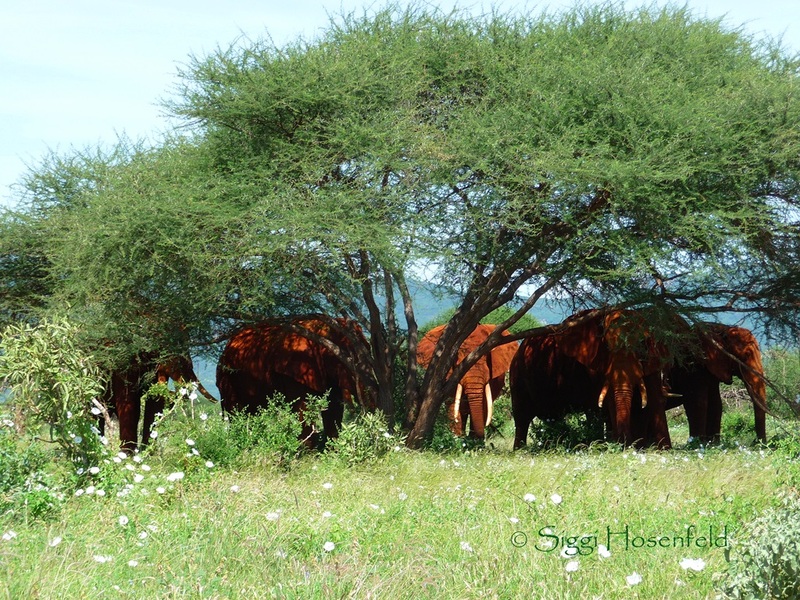 For example, Acacia seeds sprout much better after being eaten and dunged by elephants than if they simply fall to the ground. The ever grateful Dung beetles tackle the football-sized elephant droppings, break them down into little pellets and pull them into their burrows where the seeds germinate. Elephants also dig up dried-out water holes with their tusks and feet, which provides moisture for other animals. It seems, in fact, that the number of plant species is falling in the regions where elephants no longer live and recovering in other areas where the elephant is more often. 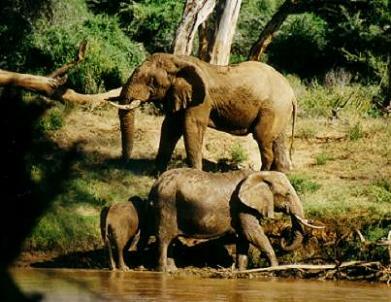 In 1987, two-thirds of Kenya elephants had been brutally killed and butchered for their ivory. Poachers went unrestricted despite a ban on hunting. 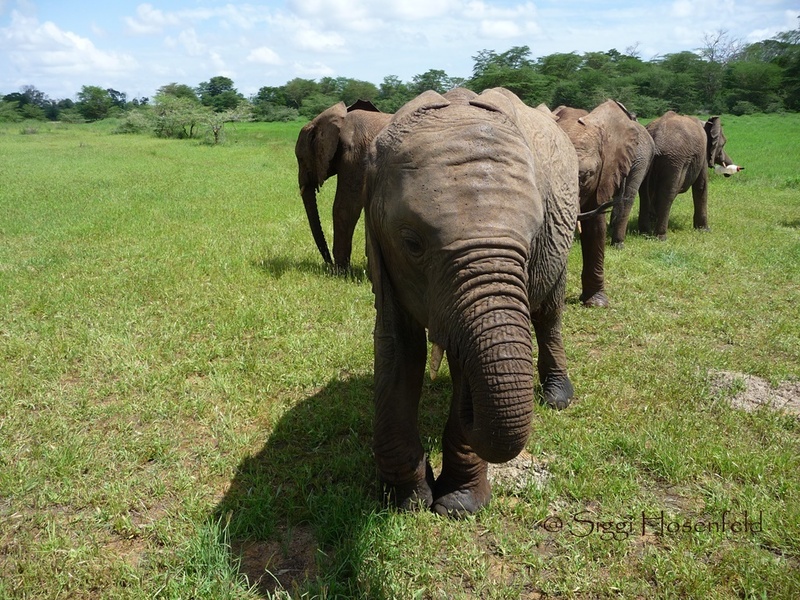 Especially Tsavo National Park, once a glorious kingdom where elephants roamed free, became a place of agonizing solitary death of hundreds of defenseless elephants killed by human greed. As the herd numbers plummeted into the hundreds it became a time for desperate action. A shoot-to-kill policy for military rangers with appropriate training and equipment was enacted and enforced. When Richard Leaky was nominated by the President of Kenya as the new Director of the Wildlife Department in 1989, he decided to let actions speak louder than words and work begun for a BIG Ivory fire. On July 18, 1989 twelve tons of ivory, worth over three million dollars and representing almost 2,000 dead elephants, where set ablaze in the Nairobi National Park and set an unprecedented example of coherence. It seems that we are in desperate need (2011) to do something similar again, as poaching still sores and elephants keep dying for their ivory in insane numbers. Considering the damage we as humans cause this planet, and comparing that to the destruction elephants do to the environment, the damage doesn’t seem all that great. Maybe we can find a way to live on this globe side by side, with a minimum of damage to the environment and help keep these incredible animals alive. 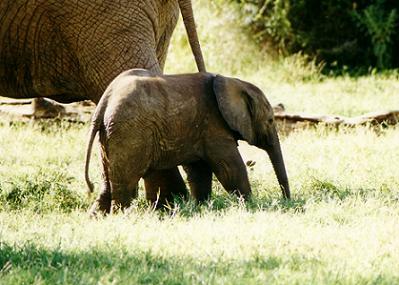 Elephants are the most engaging of all animals to watch and have always fascinated people. It might be because their interactions, behavior patterns and personalities have so many human-like parallels. They are very social, frequently touching and caressing one another and entwining their trunks. Also their extraordinary memory, their anatomical uniqueness, their great intelligence and the way they communicate have fascinated us all for a long time. The most common way for elephants to communicate is through blare sounds, which are produced through their trunk, and people who have heard that sound while visiting Africa will never forget it. They also emit infrasound at frequencies between 5 and 28 hertz, that are to high for humans to hear. These sounds can travel anywhere from 2.5 miles up to 6 miles. The elephants were the first terrestrial mammals known to make use of this phenomenon. The age-old myth, that elephants carry the tusks and bones of dead elephants to the secret 'elephant burial grounds', and also when they are getting old, to go there to die, has no factual base. Elephants do demonstrate a large concern for members of their families, take care of weak or injured members and appear to grieve over a dead companion. Did you know this about the African Elephants? That elephant babys are born after a 22 months pregnancy, with the whole family in attendance and a mere weight of about 220 pounds? That they use their tusks as either ‘left-’ or ‘right-handed’, the same as humans prefer one or the other hand? That the trunk of an African elephant weighs as much as two adult men, which makes it understandable why some elephants curl them over one of their trunks from time to time?! That the footprint of an elephant looks very much like a fingerprint, with distinct crisscross patterns of bumps and streaks? That an elephant can smell water up to 12 miles away with its trunk? That the absence of tusks in African elephants is becoming more frequent, which seems quite clearly a genetic response to the preferences of hunters for those with the largest tusks? That a tusk can suffer painful tooth decay? That elephants do not sweat as they have no sweat glands? That the ears of an African elephant are almost 3 times bigger than those of the Asian elephants? That the matriarch remembers the location of all the year-round water sources in the herd’s territory? There are some wonderful books from Cynthia Moss, who has spend more than 30 years studying African elephants and working for their conservation. She started the now famous Amboseli Elephant Research Project at the Amboseli National Park in Kenya.